Sorry for the silence this week, gang. I am in full-on Christmas prep mode, which translates into my running around like a crazy person from early in the morning until late at night. And that means we’ve been relying on family favorite recipes–old faithfuls I can toss together with my eyes closed from stuff I have in the house. So there’s not been much to chat about here. Thankfully, last night was cookie party. Cookie party is a longstanding tradition for a friend of mine, who hosts a couple dozen women in her house the week or so before Christmas for a friendly exchange of baked goods. We talk and laugh and enjoy fantastic food and drinks (chocolate martini, anyone?) and then go around the room to talk about our chosen cookie and hand out baggies for everyone to take home. The kicker is that my friend’s husband spends the next morning judging the cookies, and the winner gets a very nice prize. Things get a wee bit competitive–y’all should see the trash talk in my email box. We take our sugar and flour and chocolate very seriously. I’m typing this waiting to hear the results of this year’s competition (I’ve never won but have come in second a few times–we have some fabulous bakers in the group! ), but these cookies were a hit with my family. 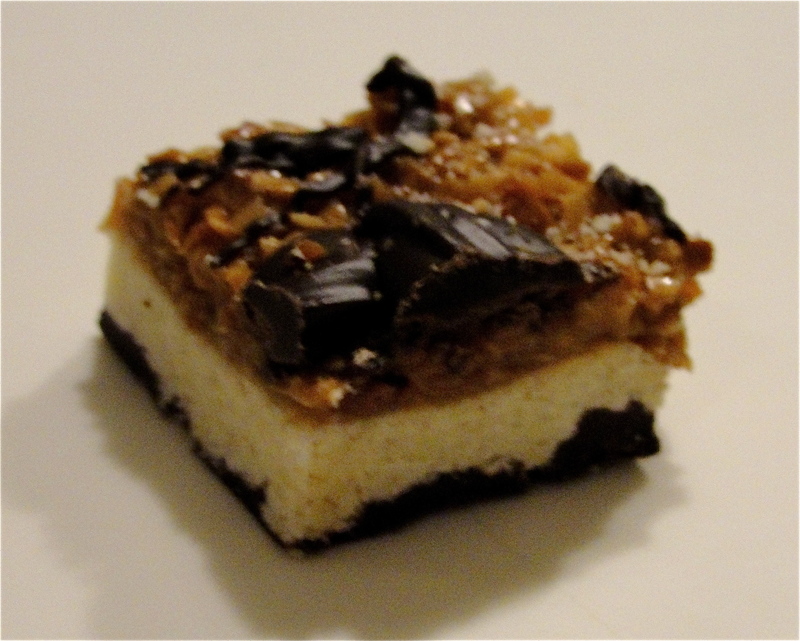 I found them on a few websites and adapted them a bit, but they’re basically bar versions of the Girl Scouts’ famous Samoa cookies, with a shortbread base, caramel and toasted coconut topping, and chocolate. These were a little time-consuming and they’re messy in the kitchen: I’m not going to lie. But I’ll make them again because they’re very yummy. I tried to simplify the original recipe to get rid of individually dipping cookies in chocolate and a few extra steps, and they turned out really well (I think). You can also just make the caramel/coconut mixture, form it into balls on wax paper, and drizzle them with chocolate to make a candy and a gluten-free option if you want. Preheat your oven to 350 degrees and line a 9 x 13 inch baking pan with parchment paper. Mix together your butter and sugar until they’re creamy. Beat in vanilla, and then mix in the dry goods. The dough will be crumbly–don’t worry. Dump it into your parchment-lined pan and use a piece of wax paper to spread it into a single layer (the wax paper will keep it from sticking to your hands). Bake for 20 minutes, or until its edges start to brown. Take it out of the oven and cool to room temperature. 1 1/2 cup dark chocolate candy discs (I got them at the craft store) or chocolate chips. When the shortbread is totally cool, melt the chocolate in the microwave and spread it over the cookie base. I used candy discs because they don’t melt at room temperature like chocolate chips do, so it’s easier to eat the finished cookies. Let that come to room temperature or put it in the refrigerator until it’s cold and totally hardened up. Once that happens, use the parchment paper to carefully lift your cookie out of the pan in one piece. Line the now-empty pan with wax paper, and very carefully peel the parchment off the cookie, turn it chocolate-side down, and place it back in the pan (this sounds harder than it is, but take your time). You now have chocolate on the bottom and cookie on top. Line a cookie sheet (with a rim) with parchment paper. Spread the coconut onto it in an even layer and bake it at 350 degrees, stirring it every five minutes or so, until it’s toasted and brown and crunchy. Watch it carefully, gang–it burns in a heartbeat. Once that’s done, put your unwrapped caramels, milk, and salt into a large Pyrex bowl. Microwave it in one-minute increments, stirring in between (with a spoon at first and then with a whisk as it melts) until it’s all liquid–two minutes was plenty in my microwave. Working quickly, stir in your coconut. Spread this mixture on top of the cookie base with the back of a spoon. You want to do this while the coconut mixture is still pretty warm–once it hardens, there’s no spreading it. It’ll want to separate from the cookie at first, but have patience–it’ll work out in a few minutes. Once that’s done, let it harden up. And when that’s done, melt another half-cup of chocolate and use a spoon to drizzle it over the top. Cool completely and slice your cookies with a large, heavy knife. A pan makes about four dozen Samoas. Trying to decide what to ask the old elf for this year? I have a few kitchenesque suggestions, some that I have and some that I want myself. Ready? Go! – Refrigerator. Need one? I have to tell you, I adore my bottom-freezer French door fridge. Most convenient refrigerator ever–all my regularly-used stuff is at eye level and the doors open way wide, which is awesome for bigger dishes. Everything–and I mean everything–fits in there (I don’t have a counter-depth model; those are smaller inside but still worth a look). Going from the evil Side-by-Side to this changed my world. Highly recommend. As for brands, I am a Kenmore fan from start to finish and it’s the only brand of kitchen appliance I’ll consider because they last forever and everybody and their dog fixes them if something goes wrong (15 years of Kenmore, I’ve had one repair). -Range. Go gas if you can and ceramic-top electric if you can’t, and shoot for the center griddle burner, which is a thing of beauty. As high BTUs as you can afford. Mine has two regular burners and two high-BTU burners, and that works just fine for me. Random note on appliances: Ask for brushed simulated stainless if you’re going for a stainless look. No fingerprints and magnets stick. Love, love, love! – Stand mixer. My KitchenAid rocks my world, is 13 years old and hasn’t missed a beat, and is a huge staple in my kitchen. Make room on your counter–you will never regret it. – Indoor grill. I still use my Foreman, but there are a bunch of models out there that are great, and they’re so nice to have for light meals that don’t require trips to the back deck. Not exactly gourmet, but they work for this busy mom. – Knives. Go quality! I love my Wusthofs, but there are a bunch of great brands out there. You want a chef’s knive (I prefer my Santoku-style), a paring knife, and a bread knife to start. And a wood block or a set of plastic knife safes to keep them in. Don’t send the elves to buy these, by the way, until you’ve tried them out and picked a set that feels good in your hands. The weight is important–it has to be comfy for you or it just won’t work. – Blender. I don’t use mine all that much, but can’t say enough about quality vs price. The cheapie ones just don’t work. Mine’s a Cuisinart and I adore it–it crunches ice beautifully and does everything a blender’s supposed to do, and comes apart to go in the dishwasher. – Food processor. Cuisinart again. My baby is now 20 years old and still awesome. Again, something I don’t use all the time, but it’s ready and waiting and fantastic when I do need it. – A bread machine. At least 2 pounds in capacity. I really do use mine all the time on the “dough” cycle. Breads, rolls, pizza dough–it’s a great time-saver. Toss in your ingredients, push the button, and find something else to do for 90 minutes. Come back to amazingly kneaded and proofed dough. My first one lasted about 10 years and then I replaced it with a never-opened, in-the-box one at a yard sale for $20. Not a huge investment. – A stainless set of measuring cups and a set of spoons. They last forever and don’t keep smells. Which is nice. – At least one, preferably two, sugar shakers. You want metal shakers with plastic removable caps over the mesh. I keep two in my fridge–one’s for cinnamon sugar and one for powdered sugar. – A mandoline. Mine is plastic and self-stores in its box, and I love it. Perfect slices every time. Dishwasher-safe, please. And for the love of your fingers, use the safety guard when you use it! – Cutting boards. Wood or plastic–never ever glass or marble, if you want to keep your knives. If you go wood, get a bottle of food-grade mineral oil to keep it beautiful. I have a wood block I keep on my counter for veggies and bread and stuff, and a set of plastic ones for meat and more odorous foods. – A heavy rolling pin. Mine is a beautiful marble one I got at a yard sale for $1. Heavy is good–makes your life so much easier. – Silicone spatulas. Plastic handles so they can go in the dishwasher. I have a half-dozen and use them all the time. Love, love, love. What’s on your kitchen list this year? Post a comment! If you live near a city as I do, you probably have food trucks racing around, parking on popular corners to dish out everything from enchiladas to cupcakes at lunchtime. At last count, my area had a salad truck, a frozen yogurt truck, and at least one sandwich truck on the streets. But my favorite one–the only one I really visit these days–is a fish truck. And the reason it’s my favorite is that I can either choose crab cakes or yummy prepared entrees, or fresh, sustainable seafood to prepare myself. Which is awesome for someone who enjoys playing with food. Several weeks ago, I bought three pounds of rockfish from my friends on the truck. I cooked some that night and carefully wrapped the rest in portions and stowed it in my freezer. Let me say this before I go any further–having a stash of raw fish in your freezer is such a huge time-saver that I can’t recommend it enough. It thaws and cooks much faster than chicken or beef and is a snap to prepare in no time. Nights that follow crazy hurricane days almost always find me pulling seafood out of the cold box for dinner. It’s easy and delicious and so good for you that it’s a complete no-brainer, and sustainable fish is a fantastic food trend I hope sticks around awhile. Anyway. We had one of Those Days last week and I pulled out some rockfish and made it like my mom used to, with breading and Italian seasoning and Parmesan cheese. Only I used Panko bread crumbs (yes, I’m on a Panko kick. Ride along with me–it’s a super fun ingredient), so my fish went into the oven instead of a fry pan, and there was nary a drop of fat involved. The result: Dinner was done a half-hour after I pulled my fish out of the freezer. My kids gobbled it down just like I did back in the day. Cleanup was super easy, and everyone wins. 1 pound (ish–a filet for each person) rockfish or other white fish. You want thin cuts for this. Heat your oven to 400 degrees. Line a cookie sheet with foil and spray it with something non-stick (I used olive oil). Skin your fish (use a paring knife and just slice the skin off, holding the fish flat and skin-down on a board with your non-dominant hand while your dominant hand gently slides the knife under the skin). Beat your eggs in a bowl. In another bowl, mix together your dry ingredients. One by one, dip your fish in the egg mixture, and then toss it gently into the bread crumb mixture to coat. Lay the filets on your baking sheet. When they’re all lined up, bake them for about 15 minutes or until they’re done (white all the way through and flakey when you stab one with a fork). Watch your kids devour fish and rock on with your bad oven-baking self. I think so. 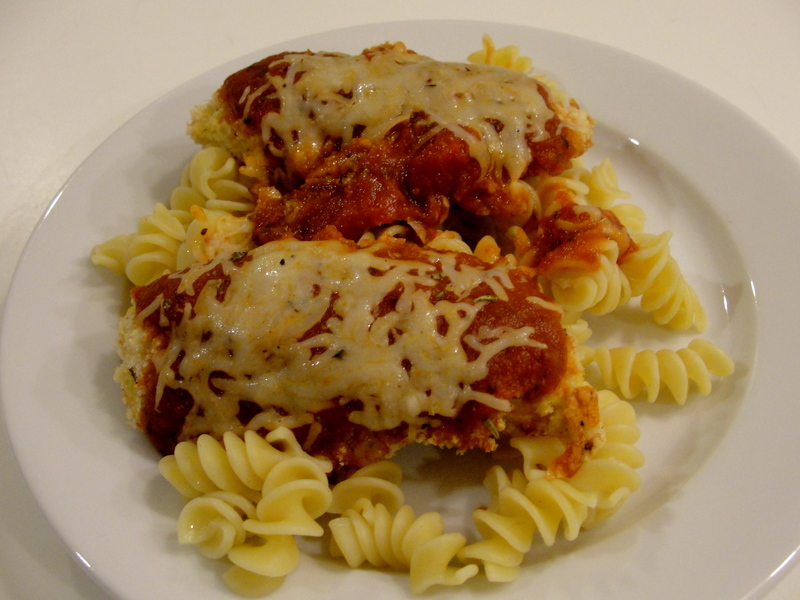 This was a great dinner–tender and full of flavor and comforting. But there was a miracle when I set plates of this on the table in front of my kids. They looked, they tasted, and that word came out of my son’s mouth. “This,” he said, ” is delicious.” And my daughter–she agreed! I’d tell you what came next, but I fell off my stool, whacked my head on the floor, and passed out. I do know they both ate their entire dinners in, like, 10 minutes with a lot of “mmmm”s and not a lot of chit-chat, and I am still looking up on my roof to see if there are burn marks where the angels from heaven must have landed to make such a thing happen. So the thing about this is that chicken parmesan is normally fried. And I’ve told you before, I don’t fry. First because it makes me feel like there’s a boulder in my tummy after dinner, and second because it trashes my stove, and I do love that appliance (spending a long time tussling with a demon-possessed range makes you appreciate one that functions properly–I’ll tell you that story another day). 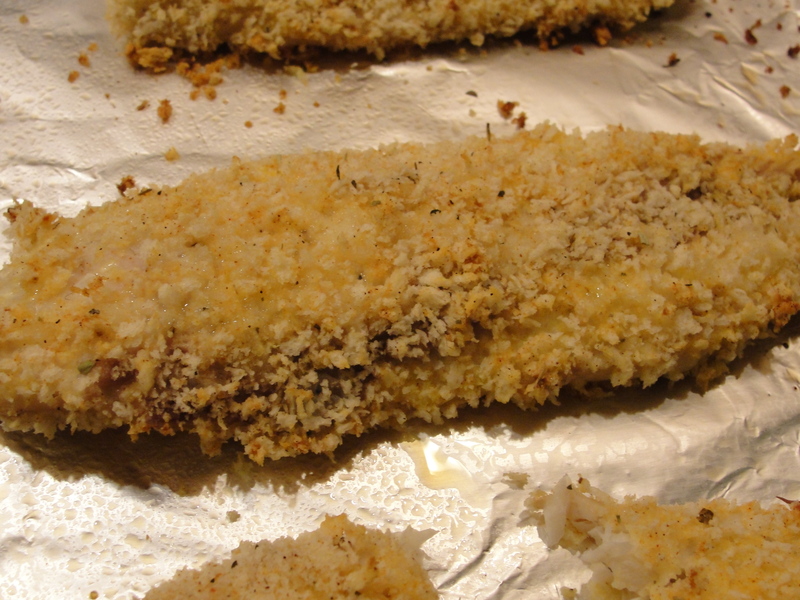 I used Panko instead of regular bread crumbs, which meant my chicken turned out crispy-crunchy without a drop of oil. Panko can be found either with the regular bread crumbs or in the Asian aisle of your grocery store, and they are worth looking for (I found mine at Target, which had two brands on the shelf). Using them let me bake my chicken and get the same results as if I fried it. Which is awesome, in my book. Heat your oven to 400 degrees. Line a large cookie sheet with foil and spray it with your nonstick goodness of choice. Beat your eggs in one bowl and set them aside. In another bowl, stir together the Panko, Parmesan, garlic, Italian seasoning, and salt. Make yourself an assembly line–chicken, egg, bread mixture, cookie sheet. One by one, dip the chicken strips into the egg to coat, Carefully roll each one in the breadcrumb mixture, give it a little shake to get rid of the excess, and lay it on your cookie sheet. When they’re all done, pop them into the oven for about 15 minutes, until they’re cooked through. While the chicken cooks, stir together your pasta sauce and Balsamic vinegar. Once the chicken is cooked through, take it out of the oven and turn on your broiler. Pour sauce on each chicken strip to cover it. Sprinkle the Italian cheese on top. 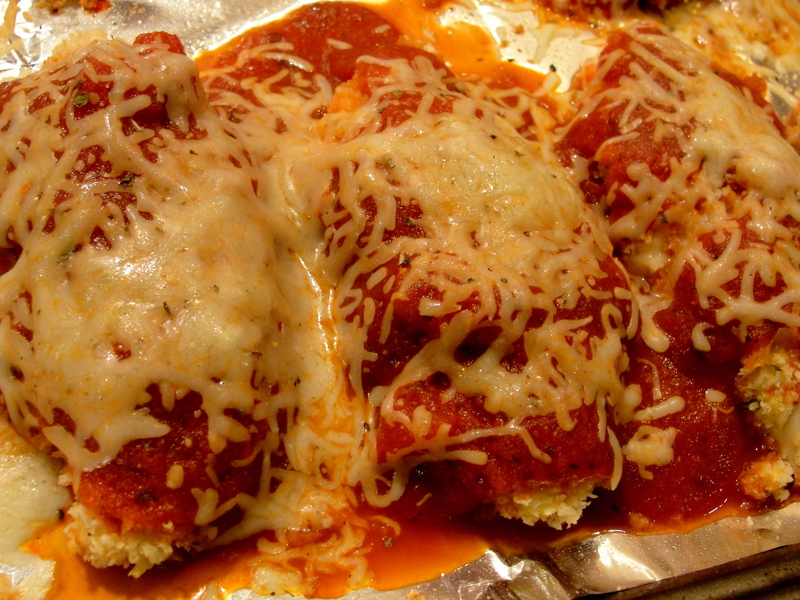 Pop them under the broiler for about five minutes, until the cheese is gooey-done and delicious. Serve alone or over pasta.